Tremithousa, Paphos – This magnificent custom built home is situated on an impressive, elevated 3000 sqm private plot in a peaceful rural setting between the villages of Tremithousa and Tala. Village amenities are within easy walking distance and Paphos, Coral Bay, the International School and local golf courses are all a short drive away. The panoramic sea and mountain views can be enjoyed from all aspects of the property and are beyond stunning. Great attention to detail has been given to the design, finish and practical layout of this unique, luxury property. Being approximately 250 metres above sea level, the property also benefits from lower humidity levels in the summer months and due to it’s location and quality build, its sheltered from the colder weather in winter. The plot has a 40% build ratio, so there is scope to extend the existing property or construct an additional building up to 700 sqm in size. 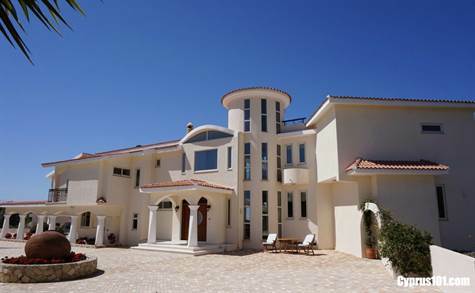 This amazing luxury villa in Paphos is certainly unique in every respect and benefits from a fantastic rural location which is both private and quiet and yet is near to all the amenities of Paphos, including shops, restaurants, beaches, golf courses and schools.